Transfers WELCOME! If you intend to transfer to our program call, write, or email the department ahead of time if you have any questions. When you arrive we'll assign you an advisor from the geosciences faculty who will help you with the ins and outs of UM's requirements. 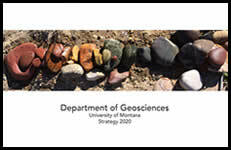 If you are wondering about which courses to finish before transferring to UM the best general advice is to take a look at UM's undergraduate catalog and try to fulfill as many general education requirements and lower division science requirements as you can; that leaves you room for our geosciences courses. If you are transferring in at the junior or senior level keep in mind that the University of Montana requires graduates to have 39 credits of junior and/or senior level coursework; thus you should accumulate upper-division credits.